In 1970 Mr. Bambic immigrated into the United States from his homeland in Eastern Europe. Having a strong electrical and mechanical background, he began working in local industries immediately. It wasn’t until the early 1990’s where he devoted his time and knowledge into the centerless grinding industry. He began working on developing a better way to separate sworf (grinding particulates) from coolant. 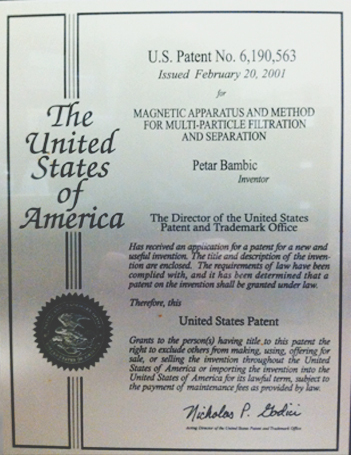 After a few years and a few trials runs Mr. Bambic invented the Multi-Particle Separator. Thus, Electro-Tech inc. was born. It was incorporated in February of 1998. The Multi-Particle Separator was patented in the late 1990’s. Big companies in the industry instantly took notice. After a few years of manufacturing and selling dozens of his ideas and machines, Mr. Bambic saw the need of extreme automation in the industry. He saw most of his customer base loading steel bars into and out of centerless grinders manually. Se he put his thinking cap back on and after several sleepless days and nights he developed a completely automated way to grind steel bars. Even though it was an early concept, companies immediately saw the value. As Electro-Tech expanded, so did its products. Early in the new millennium the EZ-Set bar fixture, an automated bar tuber, and a bar return system was created and a complete turnkey system was born. Today, Electro-Tech Inc. is recognized as an industry leader in automation processes such as grinding, polishing, turning, and heat treating. Electro-Tech Inc. has been growing and has branched out. In early 2007 Adriatic Steel was created. Adriatic Steel is a company that utilizes all of Electro-Tech Inc.’s state of the art technologies and capabilities. Adriatic Steel has the ability to process steel at a high quality standard and gives its customers a quick turnaround time. In the fall of 2013 Adriatic steel became ISO 9001:2008 certified and continues to provide on time service. As Electro-Tech Inc. and Adriatic Steel continue to grow, their roots will never be forgotten. They treat their new customers like old customers and continually provide them with a little more than they expect.